If you are visiting the Czech Republic this year and plan to arrive by air, chances are that you will land in Praha International airport, in the capital city of the country. This post gathers the basics you need to know in order to pass through its terminals without any hassle, travel to your hotel in downtown Prague and start enjoying your trip as soon as possible. 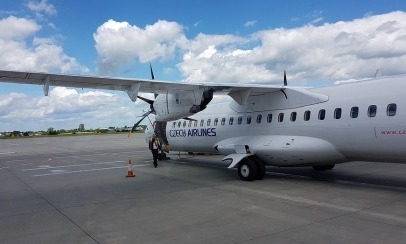 The complex stands 12 kilometres west of the town centre and is the hub for Czech Airlines, as well as a base for flights operated by the Ryanair and Wizz airline companies to and from the territory. Even when it may seem a modest one, Prague airport is actually an international gateway handling medium and long-haul connections to European countries, the Middle East and Asia, including operations via Moscow Sheremetyevo, Amsterdam Schiphol, Seoul Incheon, Paris-Charles de Gaulle, Dubai International and Frankfurt airport. Among the airlines flying to Prague both regularly and seasonally are Smartwings, Easyjet, Vueling, Hainan, Jet2, Volotea, Brussels Airlines, Eurowings, Scandinavian, FlyDubai, Emirates, Transavia, Lufthansa, Turkish Airlines, Tap Air Portugal, Flybe, Aeroflot, Air France, American Airlines, Air Baltic, Bulgaria Air, Norwegian Air Shuttle, Korean Air, China Eastern and LOT, to name but a few. Prague airport consists of two passenger terminals: the non-Schengen Terminal 1 (designated for flights from and towards destinations outside the Schengen transit zone), which is divided into concourses A and B; and the Schengen Terminal 2 (designated for flights within this transit area), which is divided into concourses C and D.
A third terminal (T3) is exclusively reserved for private and chartered aviation operations, and a fourth one (T4) is used exceptionally when receiving foreign authorities and extremely important visitors is required. The airport has yet other two buildings serving as cargo terminals. The two main terminals for passengers in Prague airport are connected by an extension of the buildings, and travellers can walk through to go from one terminal to the other. An alternative transport option is to take bus line 119, which stops at both T1 and T2 and also links the airport to central Prague. There are public transport information counters at the arrivals halls, where specialised staff will inform you of the different means of transportation available from PRG (bus and train). The international airport of Praha in Europe pays special attention to airport lovers, whether they are visitors or locals. Aside from an airport webcam broadcasting images of the airside operations 24/7, it offers guided tours to learn about the hard work behind the everyday take-offs and landings, how dispatching works and the different processes needed for a successful outcome of every single operation being carried out within the facilities. As part of the tour, those signing up for it are guided around the awarded Terminal 2 as well. With those making a connection in Prague in mind, but also for the joy of early risers, business travellers and passengers of delayed flights, the Václav Havel Airport Prague has several cafés and restaurants that stay open around the clock. Particularly popular among frequent flyers is the Black@White café in Terminal 2, with free WiFi access and great views of the apron. Costa Coffee, located in the Departures zone of T1 and T2, is the place to go for a sweet treat and the mandatory airport coffee cup, while Restaurant Praha, on the upper level of Terminal 1, boasts delicious affordable meals that give you the chance to taste the best of Czech cuisine before boarding, borrow a book from its library or play with your children in the kid’s area. Breakfast meals are served from 6:00 to 10:00 daily. Are you ready for your trip? If you have not found accommodation yet, have a look at our recommended hotels in Prague.